Turkey has detained and mistreated scores of migrants, pressuring some to return to war zones, a new report by Amnesty International says. 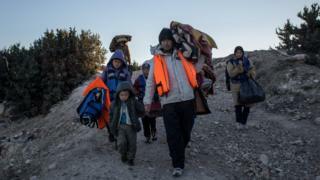 The group says EU pressure on Turkey to stem migration to Europe has resulted in the "forcible transportation" of hundreds of migrants. Pressuring them to return was in breach of international law, the Amnesty report said. Turkey "categorically denied" any Syrian migrant had been forced home. In the report, released on Wednesday, Amnesty blames the EU's "recklessness" and says it should suspend "Action Plan" - the EU-Turkey migration deal signed in November - until human rights obligations are met. It also calls on richer countries to take in more migrants. "By engaging Turkey as a gatekeeper for Europe in the refugee crisis, the EU is in danger of ignoring and now encouraging serious human rights violations," John Dalhuisen, Amnesty International's director for Europe and Central Asia, said. But a Turkish government official told Agence France-Presse: "We categorically deny that any Syrian refugees were forced to return to Syria," adding that all returnees were interviewed independently by UN agencies. Turkey has become a major transit point for people fleeing Syria, Iraq and Afghanistan and hoping to reach northern Europe. On Wednesday, two Iraqi children were found dead in the Aegean Sea after trying to reach Greece, Dogan news agency said. Amnesty says more than 100 migrants were forced to return to Syria and Iraq in recent months, but that the number may be higher. The report also documents several cases of migrants being detained without explanation. They claim to have been denied contact to lawyers and families. One 40-year-old man told the human rights group he was held in isolation for seven days with his hands and feet shackled. Turkey hosts the largest number of migrants in the world, with over 2m registered Syrian migrants living in the country. On 29 November, it signed a deal with the EU to stem the flow of migrants to Europe. In return, European leaders agreed to "re-energise" talks over Turkey joining the EU. The BBC's Mark Lowen said there was reluctance among EU members at the time due to concerns about Turkey's human rights record.